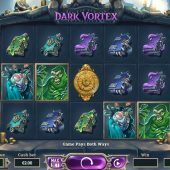 Dark Vortex slot is one eye-catching game when you open it up and one which won't leave you disappointed with its inventive new mechanic and big-win potential. The reels are of stone blocks and set over a satanic altar inside a cave, lit with candles and surrounded by gargoyles and piles of coins no doubt extracted from previous unlucky visitors. You have some creepy music to spin by and the sound of the stone blocks falling as they stop with graphics reminiscent of the Netent Blood Suckers which are not childish and go well with the theme here. Judging by the abandoned riches left on this altar, it seems a very risky place to take your bankroll so what are our chances of leaving with at least some of it, or leaving at all? We are given a standard grid of 5 reels and 3 rows which is appropriate for the 243-ways we are playing here and those winning ways pay from both left-to-right and right-to-left. Taking that into consideration plus the fact there are stacked symbols we cannot expect any big 5-of-a-kind pays here though. The basic stake is 10-coins and we get 60 for the Red Devil, 40 Purple and Green Devils and 30 for either of the Blue ones. There are 5 low-value Book icons in various colours paying 7 to 12 coins and no Wilds in the base game either but we do see very important Gold Vortex icons on all reels. You need to land 2 or more Gold Vortex symbols on any 2 or more adjacent reels to trigger some Vortex spins. For 2 adjacent icons you get 3 and for each additional one 2 more spins so all five would award 9 spins, or it's possible to get them on reels 1, 2 and 4, 5 which would award 7 spins. Each Vortex landing in these spins will add 2 spins as well. You now see the reels that held the Vortex icons expand to 5 rows thus increasing the ways-to-win and the black hole Vortex appear behind the expanded block of reels. You get 2 Pink and 5 Blue Orbs by the left and right of the reels respectively which means that 2-row stacked Wilds are added to the Vortex reels. Pink orbs can appear on reels 1, 5 and each occurrence adds 1-row to the stacked Wilds for the remainder of the spins. Blue Orbs appear on reels 1, 3 and 5 and add to the spins total should you trigger the main event here! In the course of the Vortex Spins, should you turn all 5 reels to Vortex reels you'll trigger free spins which begin with however many Blue and Pink Orbs were collected during those spins. Say you had 4 Pink Orbs and 8 Blue Orbs you'll get 8 free games with Wilds on reels 2, 3 and 4 stacked 4-high. With 3125-ways now in play it's possible to see wins in excess of 10,000x bet. You can buy the free games for 80x bet and will get two card shuffles to choose from. The first offers the chance to select stacked Wild height which can be from 2 to 8-rows and the second the spin total which can be 5 to 20. 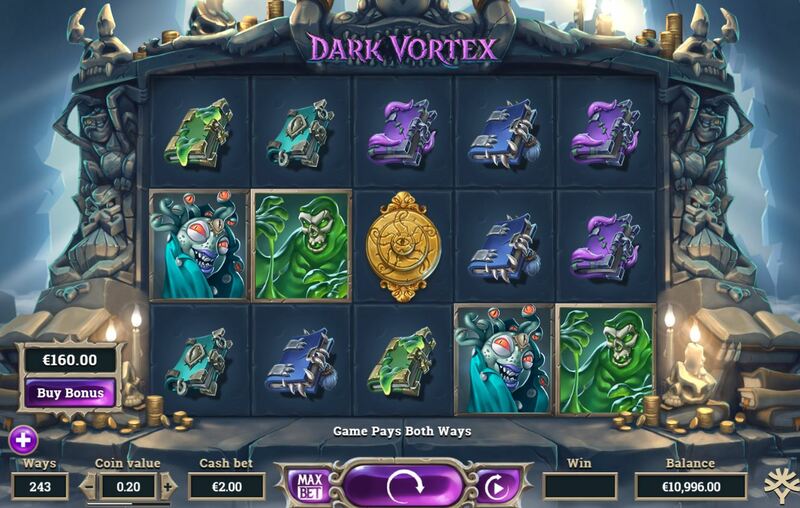 Dark Vortex slot has some decent graphics and great animations centred around the Vortex reels although I must ask why Yggdrasil use the same Wild which appears on Vikings Go Berzerk and secondly why the stupid giggle and squeaky voices that sound after some wins, which kind of makes it a bit juvenile. The RTP is the same as nearly all Yggdrasil slots at 96.30% and there is quite regular action in the base game and as I said some huge potential in the free games. With 3125 ways and all centre 3 reels Wild the wins could be colossal although from what I saw this will be very hard to achieve.